Australian Hunter magazine recently reviewed our 800cc UTV the U8, and have dubbed it a must for any Australian Hunter or outdoor enthusiast. Highlighting the article is the positive feedback on the powerful 800cc engine, fuel range, ample storage and price point. CFMoto is a global companythat prides itself on producing robust vehicles ideally suited to the needs of the hunting fraternity in Australia. The powersport manufacturing giant was established in Hangzhou, China, in 1989 and has built up a strong market share in more than 60 countries. 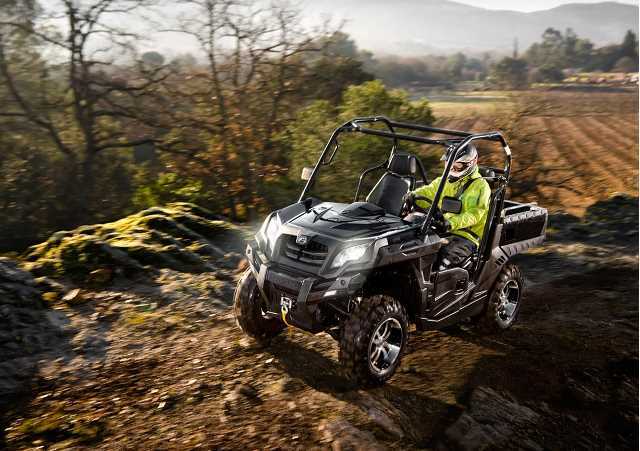 CFMoto specialises in a wide range of all-terrain vehicles (ATVs) and utility task vehicles (UTVs) that have struck a chord with hunters, as evidenced by booming sales figures. The latest model to be unveiled is the side-by-side U8, which is receiving rave reviews. CFMoto Australia director Michael Poynton says the tough, fully optioned vehicle is the perfect mixture of power and versatility. 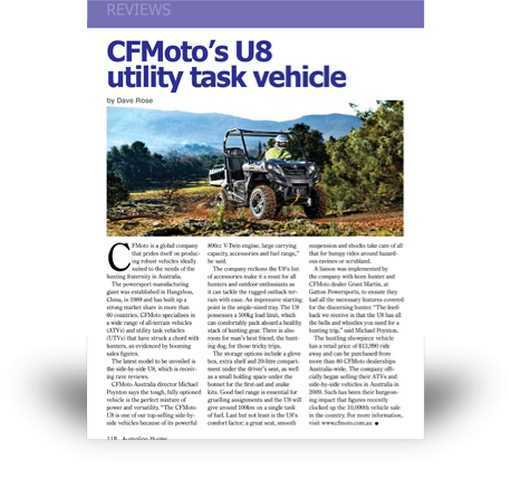 “The CFMoto U8 is one of our top-selling side-byside vehicles because of its powerful 800cc V-Twin engine, large carrying capacity, accessories and fuel range,” he said. The company reckons the U8’s list of accessories make it a must for all hunters and outdoor enthusiasts as it can tackle the rugged outback terrain with ease. An impressive starting point is the ample-sized tray. The U8 possesses a 500kg load limit, which can comfortably pack aboard a healthy stack of hunting gear. There is also room for man’s best friend, the hunting dog, for those tricky trips. The storage options include a glove box, extra shelf and 20-litre compartment under the driver’s seat, as well as a small holding space under the bonnet for the first-aid and snake kits. Good fuel range is essential for gruelling assignments and the U8 will give around 100km on a single tank of fuel. Last but not least is the U8’s comfort factor; a great seat, smooth suspension and shocks take care of all that for bumpy rides around hazardous ravines or scrubland. A liaison was implemented by the company with keen hunter and CFMoto dealer Grant Martin, at Gatton Powersports, to ensure they had all the necessary features covered for the discerning hunter. “The feedback we receive is that the U8 has all the bells and whistles you need for a hunting trip,” said Michael Poynton.